This is a long post so I thought I’d start with a brief summary of my main points in the form of a bulleted list. 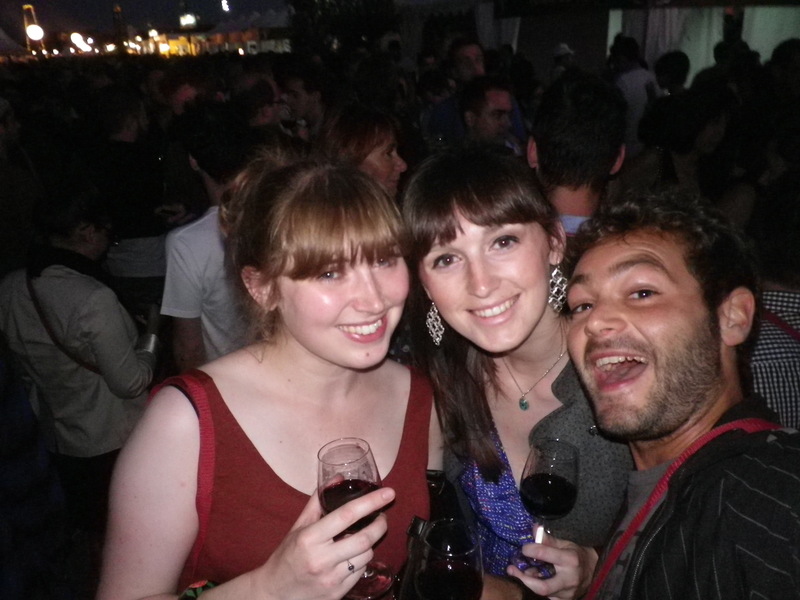 The Bordeaux wine festival hadn’t even started and it had already thrown me out of my daily routine. For the fortnight leading up to it the flower gardens on the side of the river had been fenced off and new flowers planted, so I couldn’t get to the grassy patches inbetwen to get my daily dose of sunbathing while listening to my C.B.F podcasts. 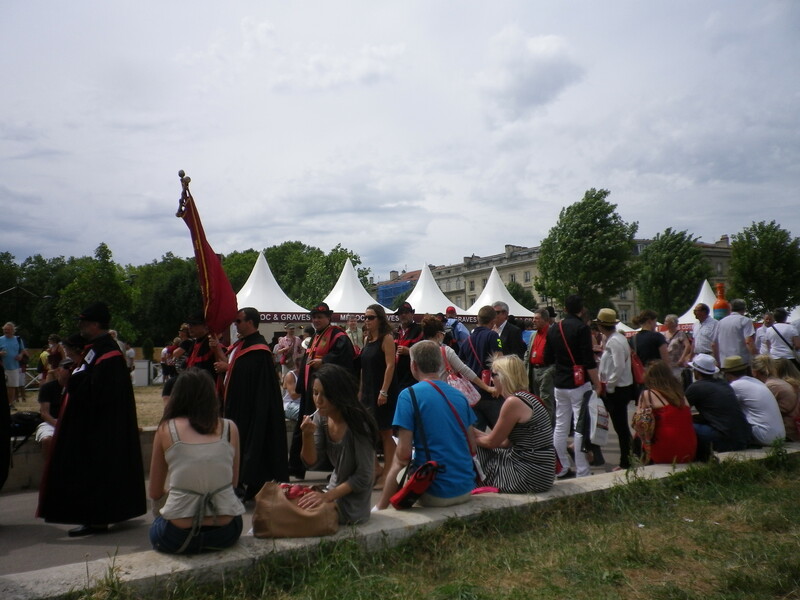 So it was clear to see that Fête le Vin was a big deal for the city of Bordeaux. The day before the festival I noticed this massive sculpture made from a mosaic of corks. 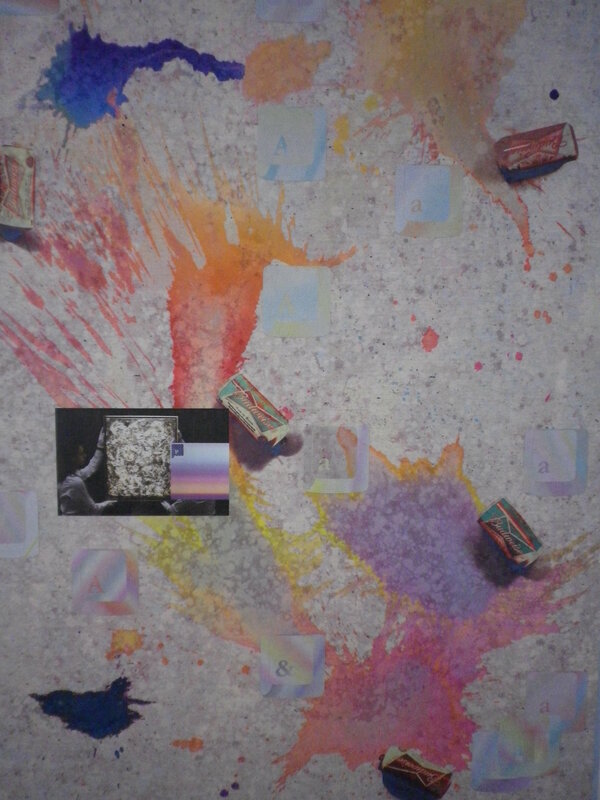 It was then I decided to visually document each day of this biennual four-day event. 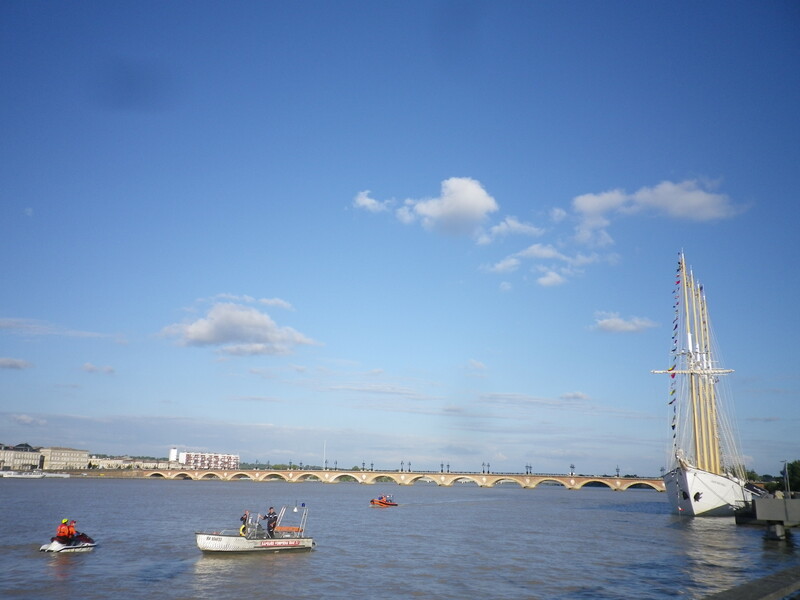 First of all I saw this big sail boat covered in bunting, police in a powerboat and people on jet skis. I thought you know what that spells… that spells party. 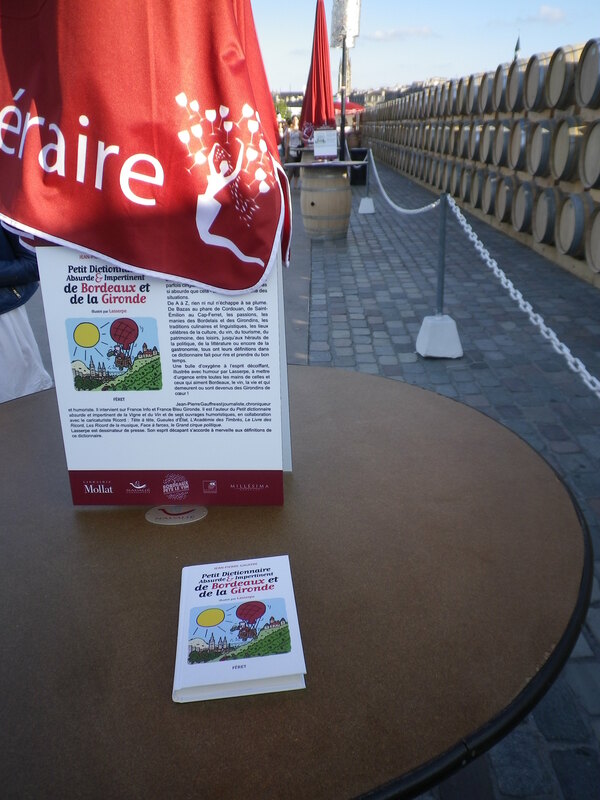 Then I got to the ‘Cuvée Littéraire‘, a kind of walkway lined win wine barrels each with two books nailed to it. Curated by Mollat (a big-name French bookshop), the selection featured books relating to wine and the local area. 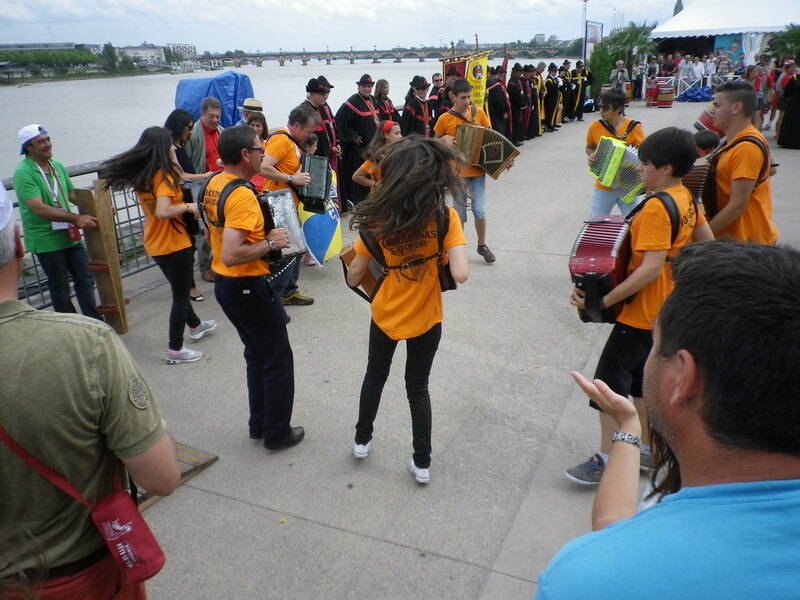 I think this is a great idea for cultural festivals. So I spent some time flicking through the selections and I think I might buy this Petit dictionnaire absurde & impertinent de Bordeaux et de la Gironde with its funny explanations of the peculiarities of the region. Knowing this evening was the opening night, I slung my wine glass holder around my shoulder and went to meet a colleague and a mutual friend of ours at a bar for some pre-drinking. After multiple Jager-bombs we were ready to move onto some fine wine. The trouble was the wine festival was now swarming with 60,000 people. That meant getting a drink was hard enough so discovering that they only filled the glass up to around the 6cl mark was really hard to take in. We were here to get crunk, crunked-up, crunkin’, (drunk and in a state of party) but it seemed as though that was going to be nigh on impossible. After our 2nd quarter glass of wine it was almost already time for the light show. So we queued for another little bit of wine and headed with the surge of bodies onto the dry ‘miroir d’eau’. Beth took a video of me drinking a sip with the light show in the background but I can’t currently get that video to work so I will attempt to describe the light show. It was a full colour projection onto buildings. At times it picked out the architectural features of the magnificent buildings themselves that partially surround the Place de la Bourse. 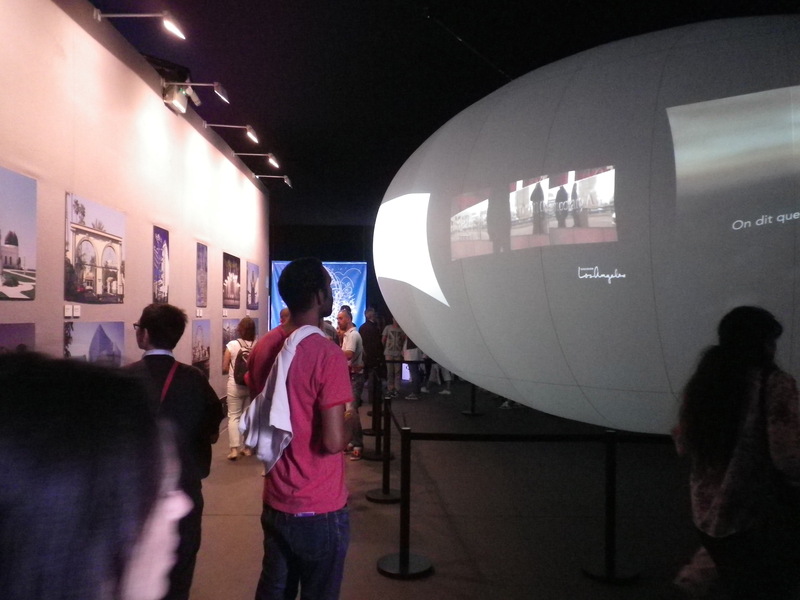 At other times moving images relating to Bordeaux, its history and the wine trade would delight the spectators, there were also many arrows, an eclectic soundtrack, and images relating to Los Angeles projected until a noisey crescendo. A visual treat. Next up was the fireworks. They were, in a word, splendid. I’m sure you have all been to a firework display before so I’m not going to describe them and I did take one picture (see below). What I can’t understand is people who film firework displays on their phones. When on earth would you ever watch that back? Or maybe they intend to send it to a friend or family member? The answer is always going to be no right? 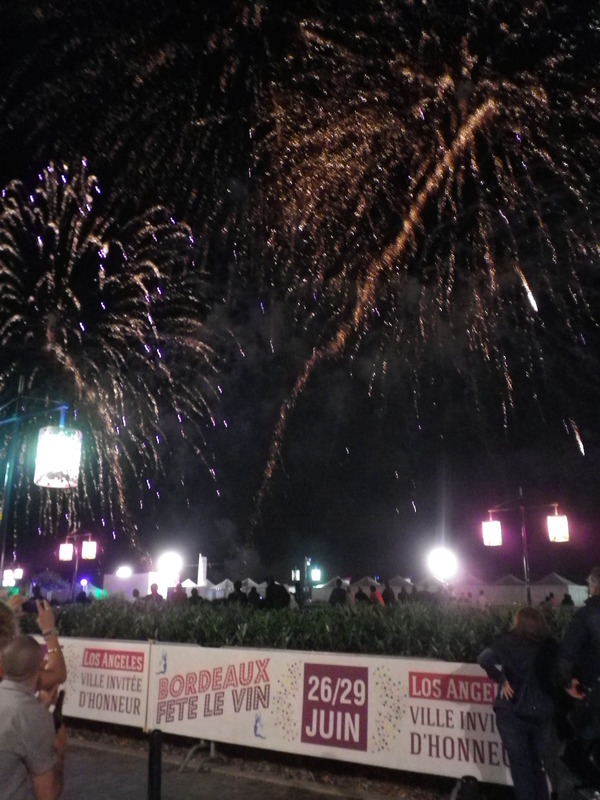 If I’m wrong and you would be interested in seeing the ‘Bordeaux fête le vin 2014 feu d’artifice‘ go to YouTube and search it, I’m not even going to put a link to it on here because I’m 100% sure nobody would click it. So instead here is a link to a video some member of the public took of the light show but honestly I wouldn’t recommend watching that either, really you had to be there to enjoy it. After the fireworks had ended the crowd dispersed, I think maybe there was a concert on but we were on a mission to crunk the night away and proceeded to do so. I can’t even remember what happened except it involved a lot of alcohol. 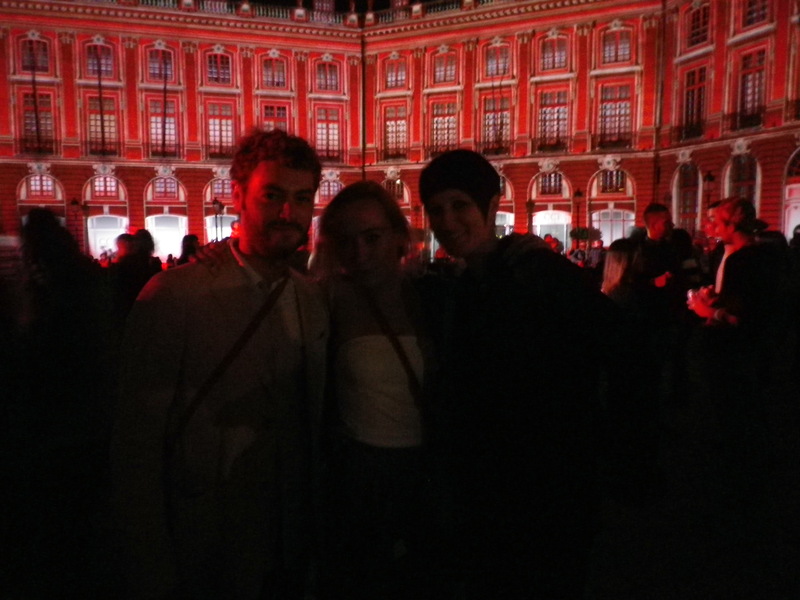 I missed the day part of day 2 but in the evening I met with some friends. The wine tasting tents were so busy that they couldn’t even be bothered to queue for a glass of wine, so we watched the light show without having drunk a drop, then when it finished went straight to a pub for a beer instead of watching the fireworks. I was then struck by a wave of absolute tiredness so I just went home and slept. Mental. 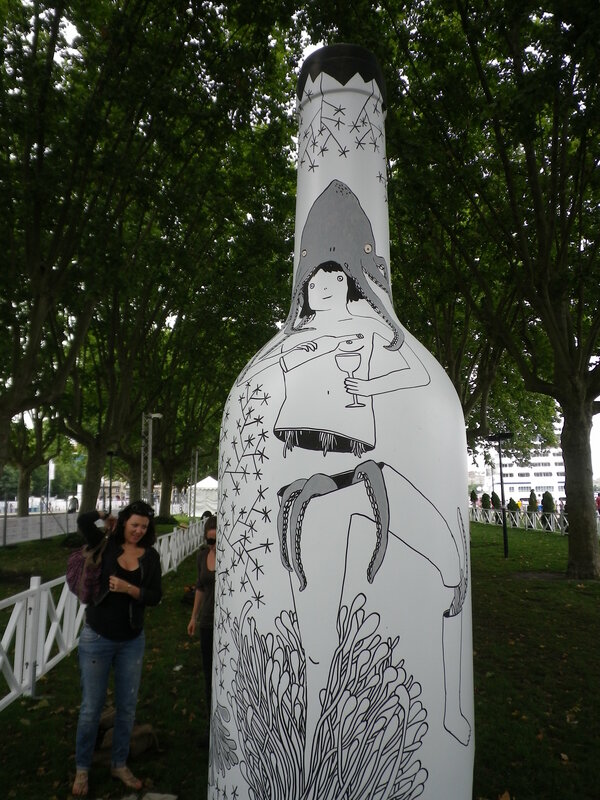 My advice then for anyone going to Bordeaux Fête le Vin 2015 who would like to get a bit tipsy during the evening would be to bring a bottle along with you. These are the only pictures I took on day two: en route to the pub in the afterglow of the light show. 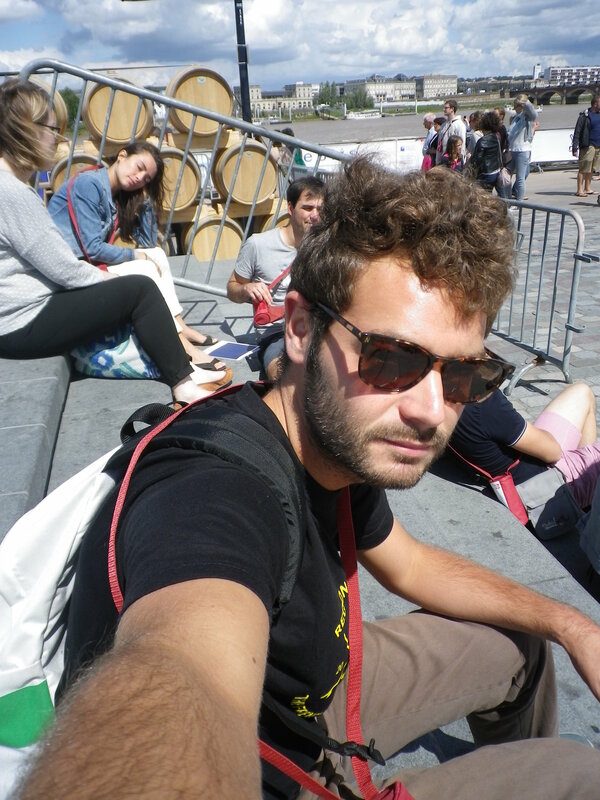 After a good nights sleep I was fresh as a daisy, so on day 3 I decided to actually drink some wine while also investigating some of the cultural aspects of the festival. 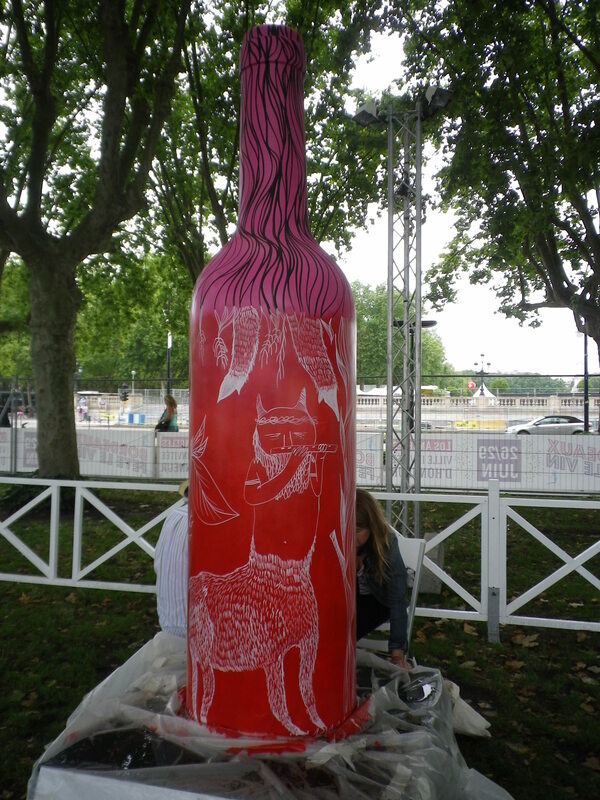 Glass in hand, I watched artists painting jumbo wine bottles. It was all good until I noticed the dolphin (see above) I do not like dolphins. 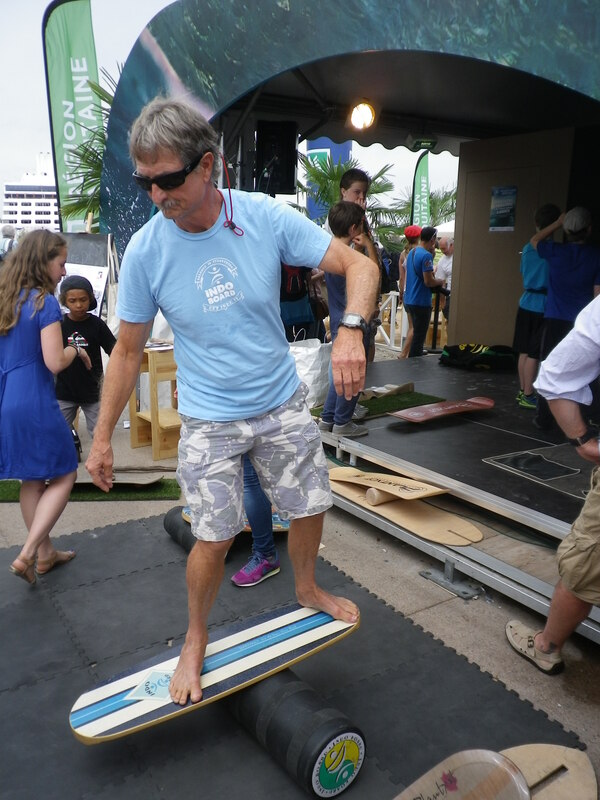 So I moved to the Région Aquitaine tent, where I got a free T-shirt and saw an old man shredding on an Indo Board. The next activity was the competitive barrel rolling. I suppose this is some kind of sport that stems from work practices around the vineyard. I took a video of some freestyle action. Then after having shown the crowd their skills they decided to ask for volunteers… the reasoning behind this was, I guess, to show that it aint easy. Nobody really wanted to do it but eventually this young buck was heavily pressured and persuaded to try it out. He was duly humiliated in front of everybody. Idiot. After this grotesque display of competitive barrel rolling I decided to sit on a wall and drink another wine. I was enjoying the flavours and the brief repose when an order of wizards walked right in front of me in single file. Over their black robes they wore burgundy sashes indicating their wizardly ‘house’ so I knew these to be the respectable wizards of Graves wine. 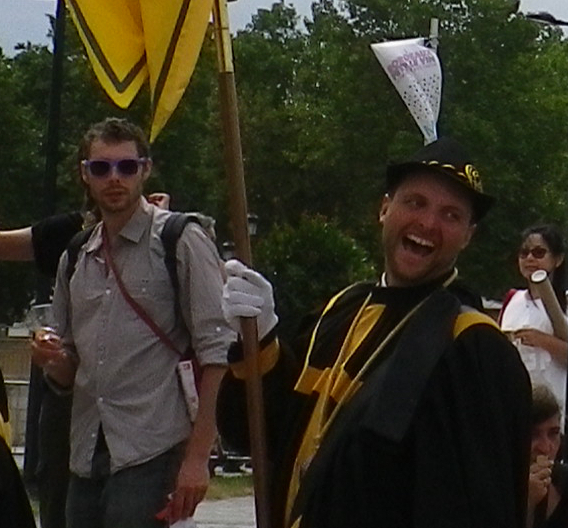 Next thing I know a second wizardly order begins to file past me wearing yellow sashes, a house that I am unfamiliar with. Their appearance and demeanor clearly shocked and frightened some of the visitors who, unlike me, had not yet reached their fourth glass of wine. These wizards seemed more volatile and highly strung than their burgundy brothers but there was no animosity between the two sects so I remained calm and followed them to see what they were doing out in the open in full wizardly garb. 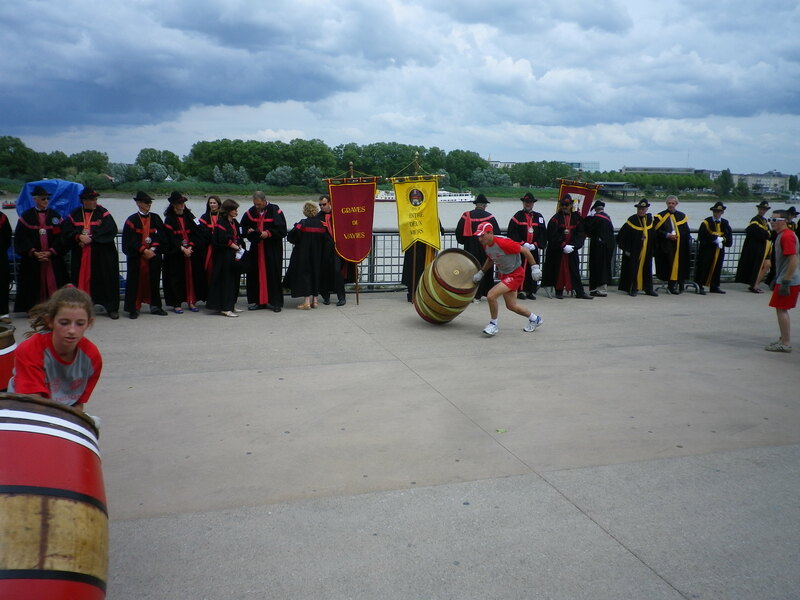 Both wizarding groups entered the barrel rolling arena to the sounds of whirly accordion music played by local youths. To my disappointment there were no magic battles, the wizards had clearly all just descended from the vineyards to observe at close quarters the barrel rolling finals. Although they were not using their wands, the presence of so many wizards had triggered high winds, causing the giant tarpaulin sign blew loose from the music stadium and the meteo office soon announced a code red storm warning. 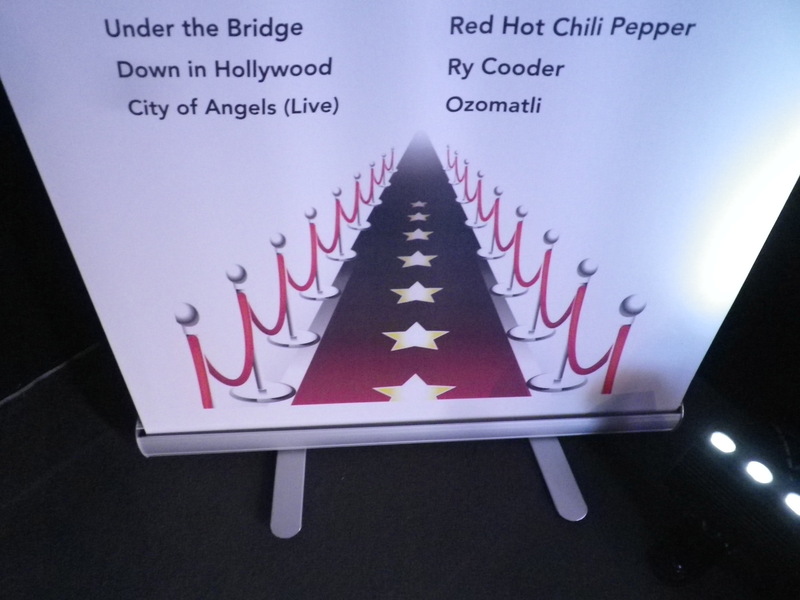 The riverside was evacuated for the evening, so I proceeded to an art gallery that had an exhibition in conjunction with festival’s guest of honor: The City of Los Angeles. 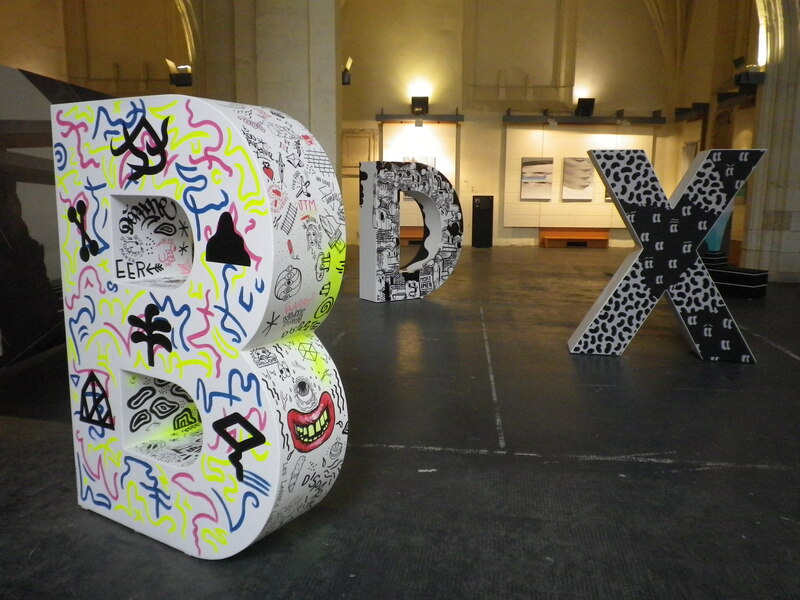 The exhibition was called BDX-LAX, FARAWAY SO CLOSE #3 featuring artists from both cities, brought together by a collective called FLASH. 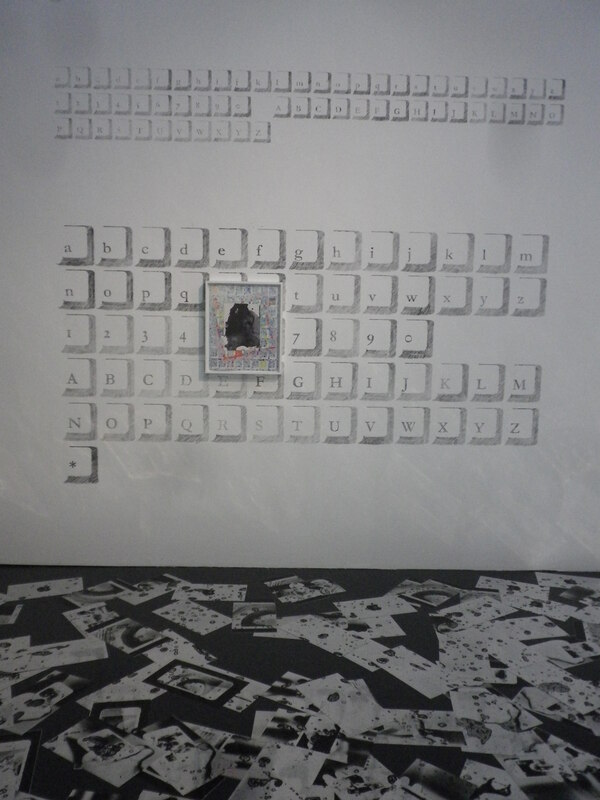 My friend and neighbour Loïc Doussin’s work was on show; it uses 2D perspectives and symbols to create patterns that make you contemplate aliens and lost civilisations while being playful, cheery and lightly psychedelic at the same time. A good trip. 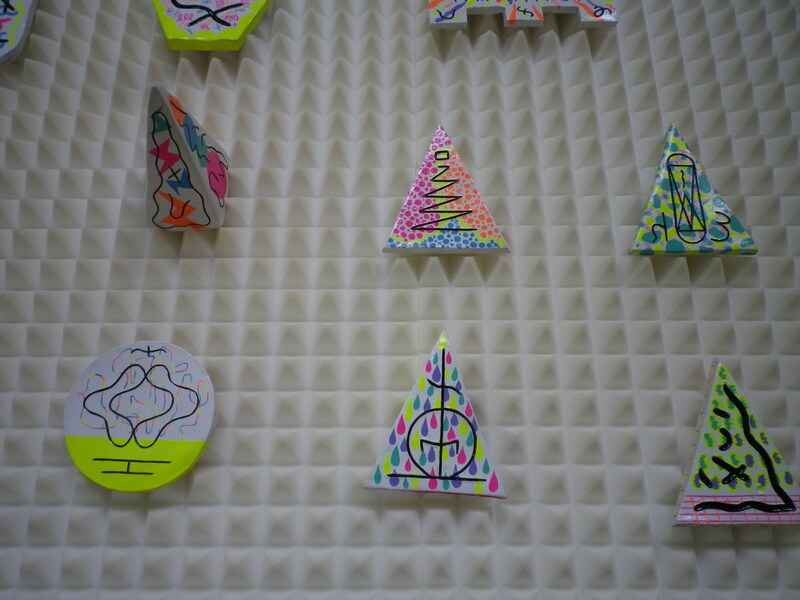 Here are some of his pyramid sculptures. 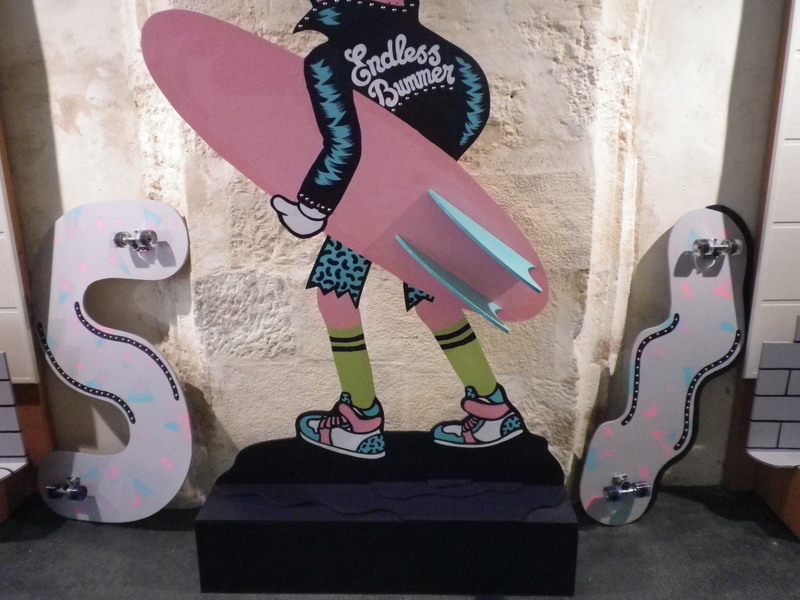 I also liked these nonsensical skateboards because they made me think that surrealism can give birth to ideas that could eventually make perfect sense. Nonsensical objects could become new ideas for products and from these products could come new ideas for activities, uses and skills. 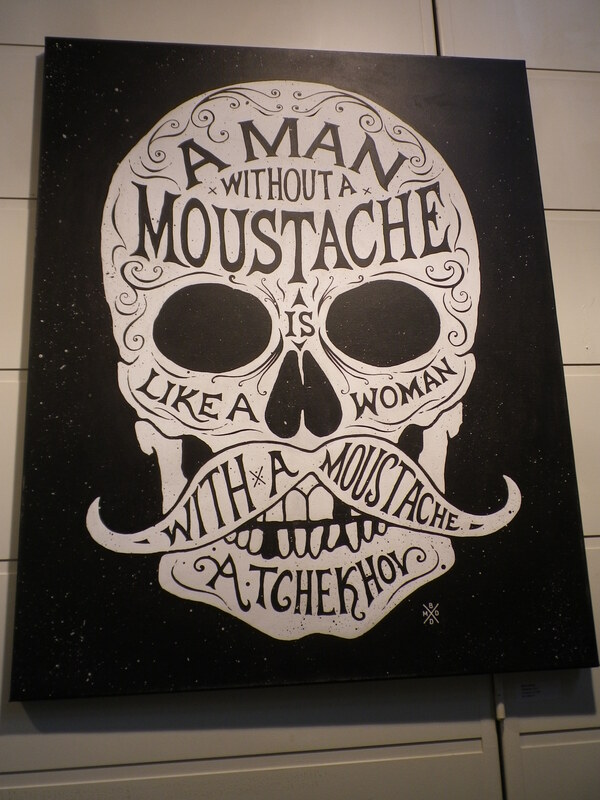 I also liked this poster with a quote from Chekhov, just because it is funny. By day four I was running out of things to do but I still had wine tokens left, so I got someone to take a picture of me in front of this Hollywood sign. It was as bad as I had expected. Like walking into a tourist brochure. 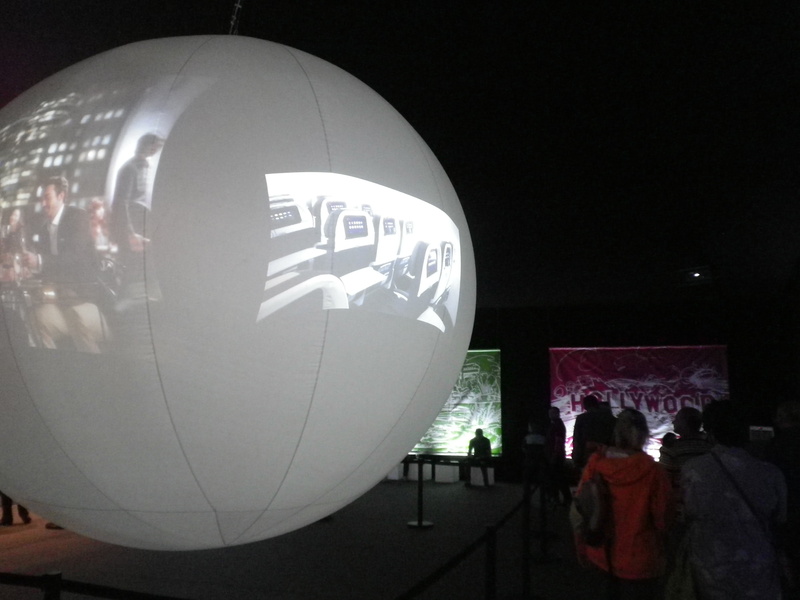 They were projecting stock images onto a white sphere, airbrushed photos of business meetings and even one of the seats on an empty aeroplane. To make it even worse the goddamn Red Hot Chilli Peppers were on the playlist and of course their song was playing when I was in there. One thing I had noticed about the festival was that there were not a lot of seats. The thousands and thousands of people who were there seemed to either be constantly walking somewhere or standing in the way of people walking somewhere. For me the festival would have been greatly improved if there were thousands and thousands of seats. Now don’t get me wrong I do realise that there was some ground space available, and I do know that it is actually cooler to sit on the ground anyway. I first noticed this emerging trend in 2009 and since then it appears to have gotten increasingly trendy to sit on the floor. 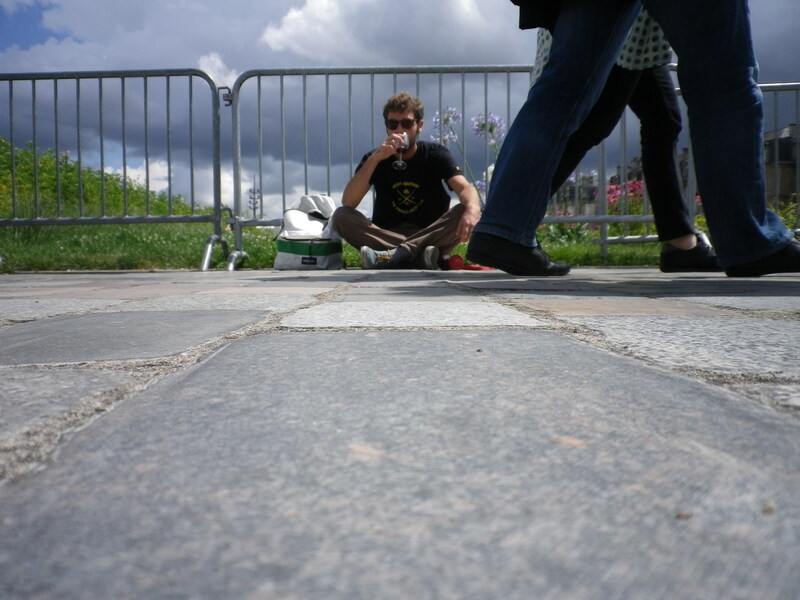 If you want to believe I am turning into a hipster then go ahead, but it was simply the lack of seats that made me to sit on the ground. I promise. After a while I decided to search out a better spot and remembered the steps around the edge of the water mirror. I’ve always prefered sitting on steps to sitting on the floor. I call it stooping, because most steps are stoops. 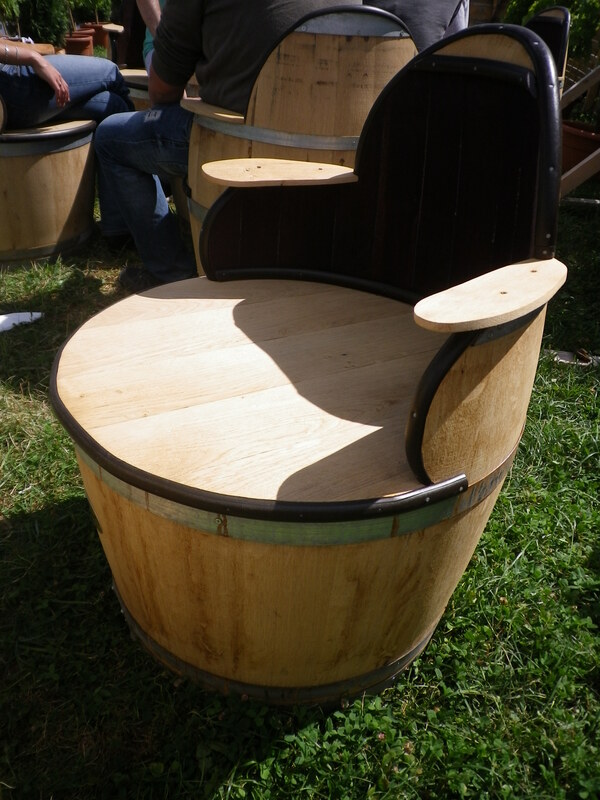 Then later in the day I came across this thing of beauty: a wine barrel transformed into a chair. Next year they should make loads of these. Loads. 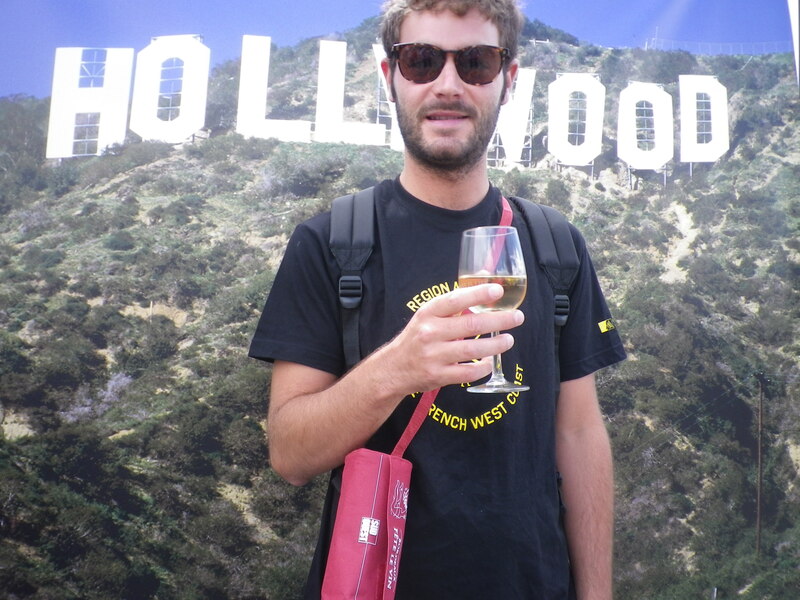 I would like to conclude with some remarks on perhaps the most important aspect of the festival: the wine itself. 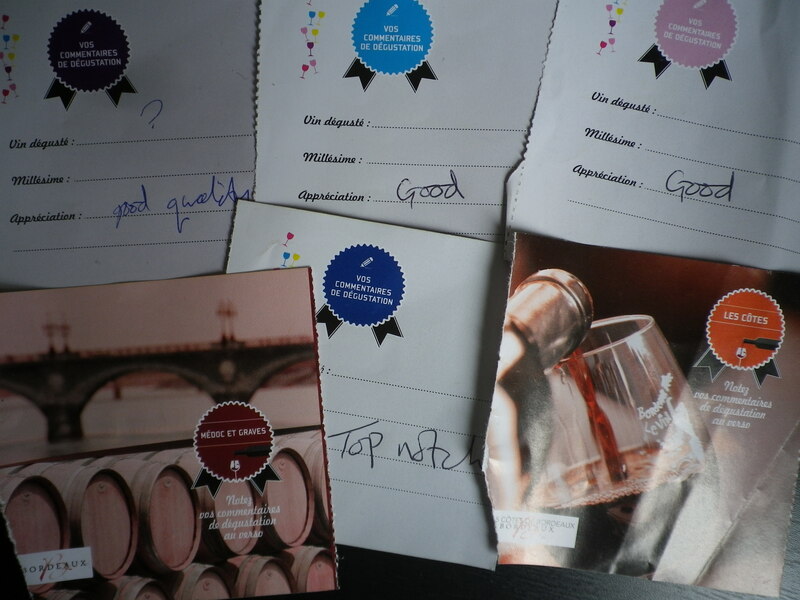 On buying the ticket you received a tasting glass and something like 13 tokens for degustations with space on the reverse side for tasting notes. Now I think I tried around 11 different wines and every single one of them was good. I gave up noting down the names and years but I think the fact that I enjoyed all of them says something in itself. I tried lots of reds, a sparkling white, a normal white, a sweet white, and even a rosé and all of them were excellent. Not a single dud. 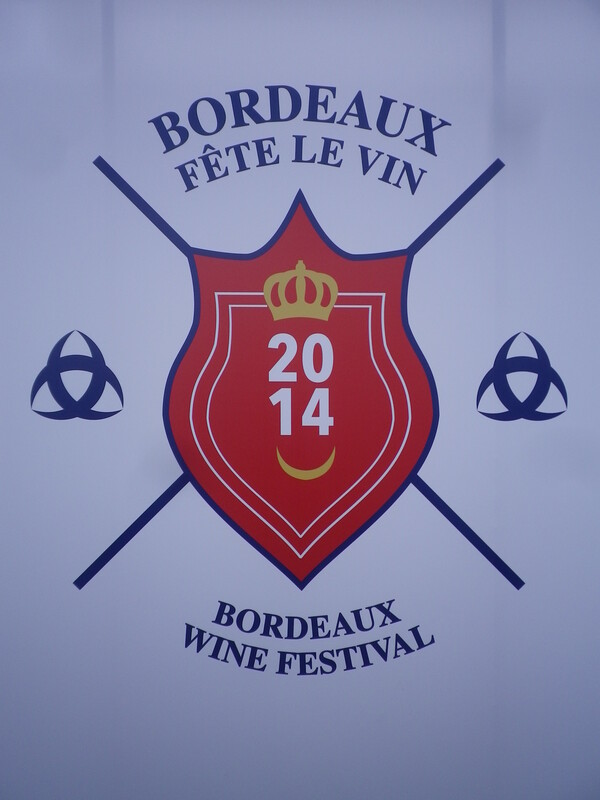 So I’d say the festival was completely successful in its main goal: showcasing Bordeaux wines. 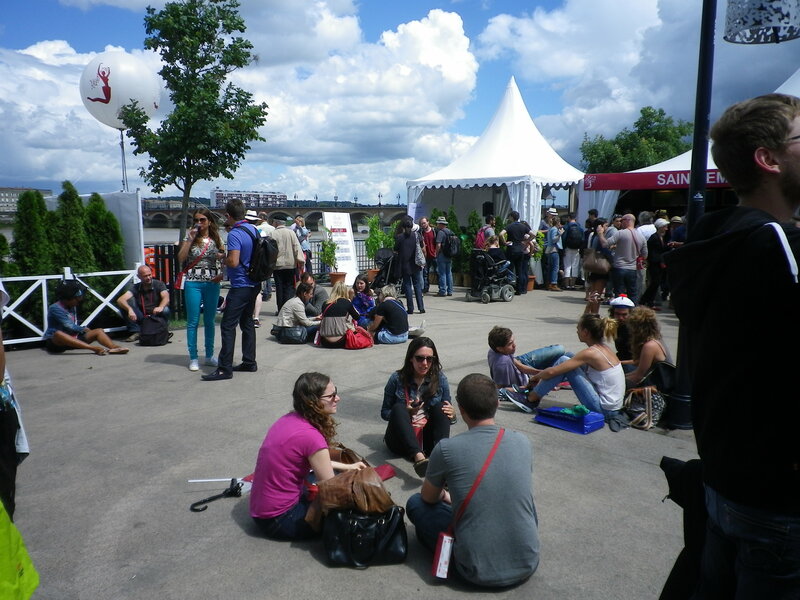 Tags: Bordeaux, Culture, Festival, wine. Bookmark the permalink.